How to create a password reset disk for Windows 7? Is easy to Create a password reset disk for Windows 7, this example is for Pro, Starter, Home and Ultimate! 1.) ... How to create a password reset disk for Windows 7! 2.) ... What to consider when using the password reset disk! See also: ► Auto login without password on Windows 7 (How to)? 1.) How to create a password reset disk for Windows 7! Image-1: Create a password reset disk for Windows 7! "control.exe /name Microsoft.UserAccounts" and press ENTER. 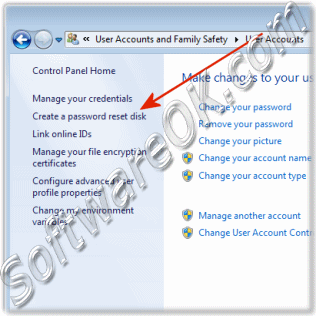 Start the "Control Panel" over "Start" "Control Panel"
Select (click) the "User Accounts and Family Safety" and then "User Accounts"
In the "User Accounts in Control Panel" (see Image-1) click on the link "Create a password reset disk". This will open (start) the "reset disk wizard"! The "reset disk wizard" helps you create a "password reset" disk. If you forget the password for this user account and are unable to log on, you can use this disk to create a new password. Note: No matter how many times you change your password, you only need to create this disk once. Warning: Anyone can use this disk to reset the password, and therefore have access to this account. To store password recovery information on a USB flash drive, insert the USB flash drive before clicking Next. 2.) What to consider when using the password reset disk! Warning, attention! Anyone can use this disk to reset the Windows 7 password and have full access to this account, careful storage is therefore advisable, even without the current password you have access to the user account with the disk. Labels on this disk are not recommended, such as: password remnants, Windows 7 password , password recovery , password backup, or any other name that suggests that you can recover the user password. It is also simply a way to give unauthorized persons the opportunity to bypass the Windows password. If you have information about to save Windows 7 password recovery on a USB memory stick, connect the USB memory stick beforehand. Windows-7 - FAQ-45: How to create a password reset disk for Windows 7? Windows 7 password, reset, recovery, restore how to? Windows 7 starter password reset disk? Find Password for Windows 7 reset disk, hack keyword? Hack the Password for Windows 7 reset disk? Windows 7 starter password reset? Password reset disk unable to logon? How to make password reset disk for windows 7 home basic? Universal windows seven password reset disk? Create partition volume windows 7? Download password reset disk windows 7 starter? Problem with new Partition or Volume for windows 7 starter? Format command windows 7 cmd?